Robert K. Musil was the featured Howard E. Woodin Colloquium Series speaker at Middlebury College’s Franklin Environmental Center. Musil was introduced by Dr. Molly Costanza-Robinson, Director of the Environmental Studies Program which, founded in 1965, is the oldest in the nation. Musil spoke about what Rachel Carson would do today, explaining that Carson was deeply anti-nuclear and would have been concerned about Fukushima and American reactors, as well as continued nuclear testing and proliferation. Carson also would have been supportive of efforts to halt global climate change since she had worked closely with Roger Revelle who had the first CO2 monitoring station built in Hawaii in 1958. Revelle also later taught Al Gore about climate at Harvard. Carson also would have been aware, Musil said, of early reports, beginning in 1960, of rising CO2 levels, climate reports from the Conservation Federation and others, and early White House discussions of climate during the Kennedy Administration. Musil also emphasized that Carson did not work alone, but was a part of a large network of scientists, environmental organizations and political activists. Musil acknowledged and thanked the work of many at Middlebury who helped ignite contemporary climate activism. In addition to the renowned author and activist Bill McKibben, who is a Distinguished Scholar at Middlebury, Musil noted the role of Economics Professor and head of the Center for Social Entrepreneurship, Dr. Jon Isham. 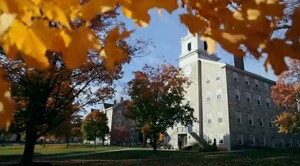 Isham helped pull together a Middlebury Conference in 2004 with leading environmental advocates that called for a climate grassroots movement and put out the seminal book Ignition: What You Can Do to Fight Global Warming and Spark A Movement with an Introduction by Bill McKibben and chapters by Isham, Musil, Rebecca Gould, and others.